The design details for the future of Jasper Avenue are ready for viewing. The aging roads and sidewalks along Jasper Avenue (109 Street to 124 Street) are slated for full reconstruction starting in 2019. 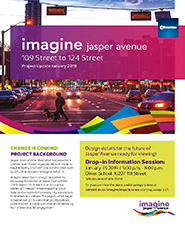 The Imagine Jasper Avenue project began as a community-led vision to not just remove and replace the infrastructure as it currently exists, but to use the reconstruction as an opportunity to enhance the avenue with an innovative, vibrant and relevant streetscape. A Jasper Avenue that would function as both a link and a destination; balancing the needs of the community, commuters, businesses and visitors. 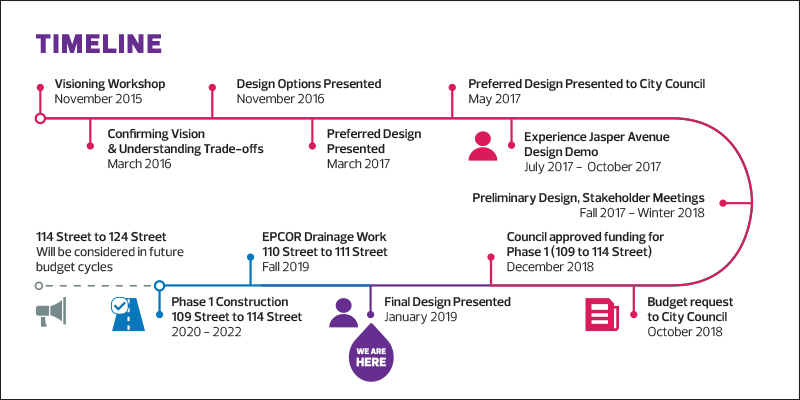 Developing the design for Jasper Avenue, which began in September 2015, was guided by Main Street Guidelines, driven by technical and physical roadway requirements and informed by the public and stakeholders through 4 phases of engagement. The public engagement process allowed for input from all user groups including area residents, commuters, cyclists, pedestrians, business owners/operators, property owners and developers. Input was used to inform the development of Vision and Guiding Principles, determine priorities and trade-offs as well as influence design possibilities. The Experience Jasper Avenue design demonstration from July 2017 – October 2017 allowed the City to test the design resulting in several adjustments to the plans.